A photo of Todd's Drive-in taken from a Westside High School yearbook. 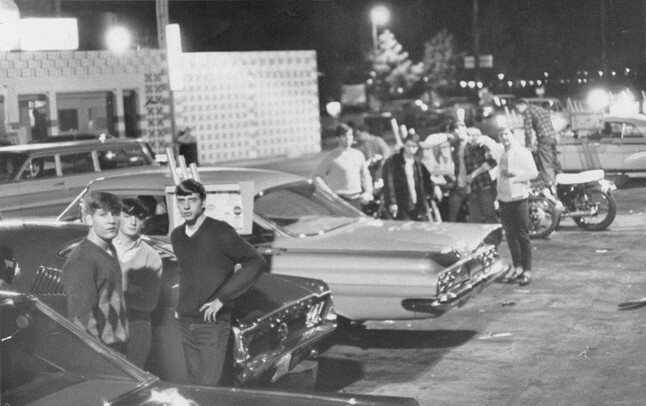 Todd's Drive-in is shown in this 1968 photo. The cars had changed since the 50's, but Todd's hadn't. Esquire magazine once called Todd's the city’s most popular spot for teenagers. Omaha teenagers flocked to Todd’s Drive-in restaurant in the late 1950s and through the ’60s, and owner Steve Urosevich was the man in charge. In recent decades, his dad heard from countless people who said they had met their spouses at Todd’s or had taken their first dates there. Steve, a son of Serbian-immigrant packinghouse workers, and a longtime supporter of youth sports, died of kidney failure July 23, 2014 at 93. Steve and his wife, Helen, who died three years ago after 69 years of marriage, raised sons Steve, Bob and Todd and daughter Sueann, and enjoyed 12 grandchildren and 23 great-grandchildren. Todd’s Drive-in was emblematic of the culture captured in the classic 1973 film “American Graffiti,” which was set from 1964 to 1967. Instead of the movie’s Mel’s Diner, Omaha had Todd’s, which Esquire magazine once called the city’s most popular spot for teenagers. In that era, teens would “cruise the strip” or “drive the loop” between Todd’s at 77th and Dodge and Tiner’s restaurant at 44th and Dodge. 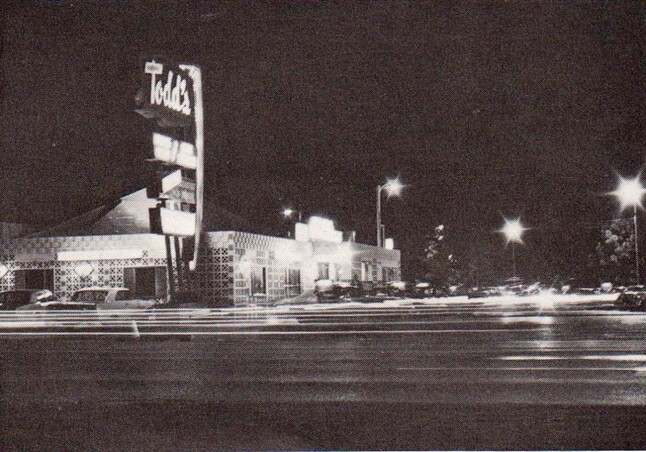 On weekend nights, cars sometimes would be backed up for a half-hour waiting to get into Todd’s. Some of those teens became Omaha leaders in business, education, politics and other fields. Mike Devereaux, a retired vice president of sales for the Omaha-based national election firm ES&S (Election Systems and Software), recalls driving his two-tone, blue and white ’55 Chevy. Steve Urosevich graduated from Omaha South High School, got married and earned his wings stateside in the Army Air Force. He later worked as a district service manager for the Ford Motor Co. 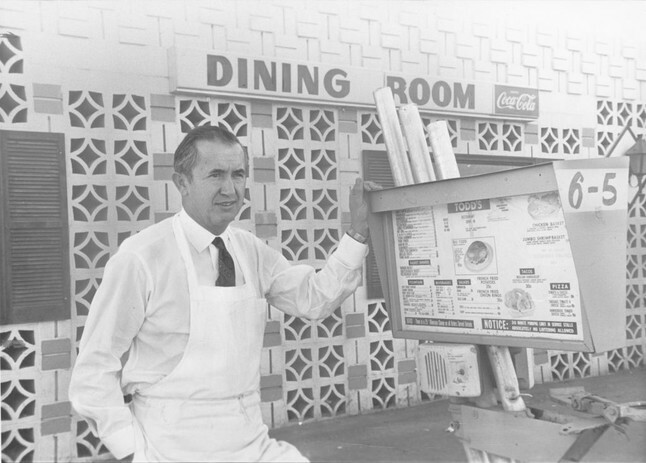 In 1957, he acquired the Wishbone Steakhouse and converted it to Todd’s Drive-in, with more than 60 stalls equipped with speakerphones for ordering. Friends, though, knew he was the Todd whose name was up in lights. It caused as much razzing as it did a modicum of teen celebrity. During the 1960s heyday of Todd’s, the three Urosevich brothers played multiple sports at Westside High. After football or basketball games, students from various high schools would converge on Todd’s. Steve Urosevich said in a 1968 World-Herald interview that as many as 1,500 cars arrived on peak evenings, mostly teens or young adults, and that he spent thousands annually on security officers. For the most part, problems were few. In 1960, in the early years of the Todd’s-Tiner’s loop, a tragedy occurred. Kids at Todd’s knew something terrible had happened when they saw many emergency vehicles, with sirens wailing and lights flashing, driving east on Dodge. After football games on that October night, a group of teens cruising the loop were riding in a car that turned into Elmwood Park at 11:30 p.m. The car struck a tree at high speed and six teenagers were killed — still believed to be the deadliest auto accident in the city’s history. Investigators suspected drag racing, but witnesses never came forward to identify another vehicle. Dodge Street itself was busy and closely watched, and nothing remotely similar ever happened on the actual Dodge loop. Todd’s created a mostly fun atmosphere and fond memories for thousands of baby boomers who could see friends, show off their cars and order a Todd Burger for 65 cents. Owner Steve appreciated his young clientele, who were coming of age during the civil-rights movement and the Vietnam War. A year later, in the fall of 1969, Urosevich closed Todd’s and said without elaboration that he had decided to reorganize. He sold the building, which was razed. Steve Urosevich remained active in other pursuits and watched his extended family grow. Son Bob Urosevich founded ES&S in the 1980s, and the siblings joined him. They were also very active at St. Nicholas Serbian Orthodox Church. Steve lived a very long life that included much more than running an iconic 1957-69 restaurant. But Todd’s left an indelible mark on a generation.